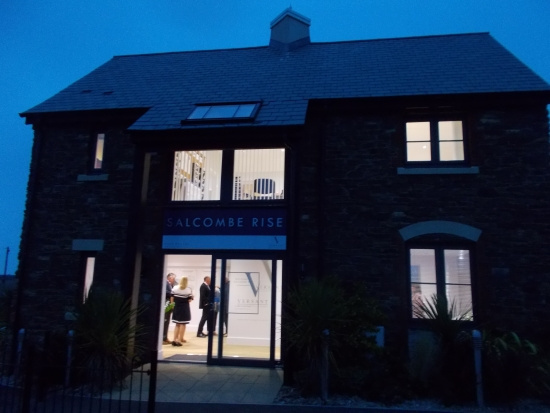 One of the latest jewels in Versant’s residential property crown is Salcombe Rise, situated in the ever-popular South Hams town of Salcombe. Frank Mountain, a visionary and strategist with extensive business acumen and 20 years of experience within the commercial and residential property development sector, was delighted to welcome guests to the opening of the Marketing Suite there. Having founded Versant Developments & Homes in 2012, he has an excellent eye for spotting a good location and a dedicated team behind him for delivering a luxury finished product. The twelve spacious, new 3 and 4 bedroom homes being built at Salcombe Rise were stylishly displayed in the contemporary Marketing Suite and The Galley Girls provided delicious catering on the night. The guests mingled and viewed the site, as well as enjoying drinks and canapes. The internal specifications where available to view, for guests to acquaint themselves with the excellent choice of buyer options. So why not drop into the marketing suite at Salcombe Rise to see for yourself. Open Friday, Saturday, Sunday and Monday from 10am – 4pm, where a warm welcome waits you and parking is easy.